Built: 1929, Standard Steel Co. 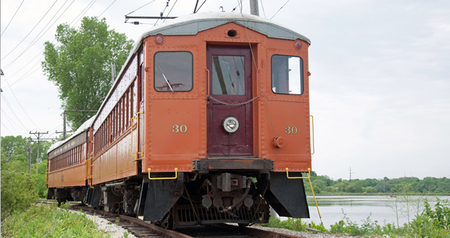 Car 30 is possibly the best example of an interurban coach currently at the Museum. Since it was never modernized by the South Shore Line, the style of the interior is a good snapshot of electric car building at the height of the interurban era. The high arching steel-panel ceiling and frosted-glass pendant light fixtures give the grand feeling of a spacious car, while the leatherette semi-bucket seats, mounted on swivel pedestals to allow forward-facing seating, were the last word in electric line luxury. Also still intact is the walk-around smoking compartment, wherein the aisle offsets to the side of the car to permit the closed, six-seat smoker. The original coal stove of the car heating system remains in place as well in a closet behind the #1 cab. In the process of making the car operable on the East Troy line, the roofline was also brought back to its original shape by removing the pantagraph humps and horn fairings added as a modernizing makeover in the 1950's.